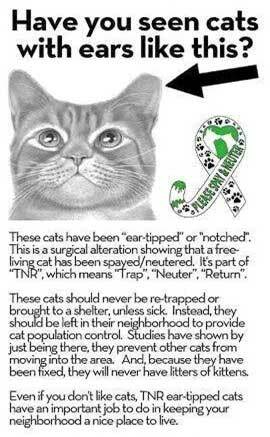 Trap-Neuter-Return, commonly referred to as “TNR” is the only method proven to be humane and effective at controlling feral cat population growth. Using this technique, all the feral cats in a colony are trapped, sterilized by the neutering of males and spaying of females. Each cat is marked by “ear tipping”, cropping 1/4 inch (6 mm) off of the tip of the left ear, so that it can be easily recognized as having been sterilized and as a member of a managed colony, so that the animal is not subjected to unnecessary surgery, confinement or euthanasia.After the cat is sterilized it is placed back in the trap and allowed to recover from surgery and then returned to their territory where caretakers provide them with regular food and water. In a few days after being released, the cats will return to their usual routines. Young kittens who can still be socialized, as well as friendly adults, are placed in foster care and eventually adopted out to good homes. The nuisance behavior often associated with feral cats is dramatically reduced; including the yowling and fighting that come with mating activity and the odor of unneutered males spraying to mark their territory. The cats are returned to live out the remaining of their lives (which is 6 years on average for feral cats) and continue to provide natural rodent control.